Jackson County Paramedic Coty Peardon is known as an “A-team player” who always steps up to help out. Often, Coty volunteers before he is even asked. Coty has also been the recipient of many local, state, national, and departmental awards, commendations, and titles. When Coty was 16, he joined an EMS scouting group called Venturing that offered camping, whitewater rafting, and ambulance ride-alongs. There, Coty learned the true merits of teamwork while finding his calling to help others, and a passion for EMS was born. 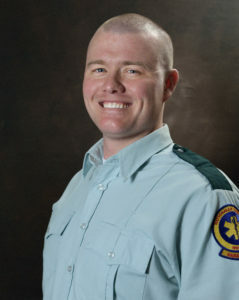 After graduating high school, Coty enrolled in Northwestern Technical College’s EMT-Intermediate/BS program, in Georgia’s prestigious EMS Region 1. During the yearlong EMT program, Coty worked full-time as a cardiac monitor technician, obtained his AHA BLS instructor certification, and still graduated with honors. While continuing to work full-time as an EMT and attend Paramedic school, Coty made time to develop additional skills. Coty achieved his National Senior Firefighter, Fire Apparatus Operator, and Paramedic Rope Rescue certifications before graduating with honors and receiving the Excellence in Advanced Airway Award. Coty hasn’t slowed down since joining the Acadian Ambulance team in November 2015. Within a few months, Coty obtained his Critical Care Certification, once again landing among the top in his class. Coty is currently helping to revamp the new-hire process in Jackson County, establishing an Acadian Explorers Post, and creating an EMS competition. Coty is also actively pursuing his flight paramedic certification. Acadian is proud to recognize Coty as our Louisiana/Mississippi Paramedic of the Year as well as an AAA Star of Life.